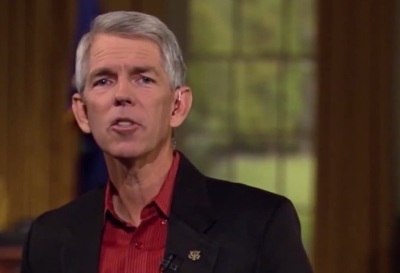 American history author David Barton recently claimed that over half of Christian college students lose their faith while studying at their higher education institutions. "Between 71-88% of our Christian kids who go to college are renouncing their faith at college, and...over 50% of our Christian kids who go to Christian colleges are renouncing their faith at Christian colleges because the professors in the Christian colleges were trained by the pagans in the secular colleges," Barton said on the Kenneth Copeland's Believer's Voice of Victory program earlier this month. "So those Christian professors, 'Christian' professors, are trained by those pagans and they think like the pagans. They're living in Egypt and they think they're Egyptians instead of Hebrews," he added. Warren Throckmorton, a professor of Psychology at Grove City College and the author of a book refuting Barton's historical claims about Thomas Jefferson, said that he did not understand the origin of Barton's claims. "[Barton] often has something to tie his remarks to but it's taken out of context or factually altered. For instance, the claim that 71-88 percent who go to secular colleges renounce their faith, that's only partly right," Throckmorton told The Christian Post. Throckmorton instead pointed to a 2011 Barna study that he said on the surface suggested only 60 percent of students kept their faith. "But even then when you see what Barna says about the students you don't see that they've renounced their faith. You see that some do...but they're essentially not going to church. They still believe in God. They still have interest in spiritual things but they are questioning their childhood church." "They kind of go into a spiritual limbo but that doesn't mean they renounce their faith. And many of them come back," Throckmorton adding that Barton's over-generalization was a "pretty typical way he uses statistics." While acknowledging that he had not "read everything on the topic," Throckmorton also said he was skeptical about the Christian college claim but said that he had searched for a study on it and had been unable to find anything. "I teach at a Christian college. I can't believe for a minute that 50 percent of students are renouncing their faith," said Throckmorton. The politically-connected Barton founded the organization WallBuilders in 1989 to educate "the nation concerning the Godly foundation of our country" and provide "information to federal, state, and local officials as they develop public policies which reflect Biblical values." The WallBuilders' website sells DVDs, books and curriculum "to educate the public concerning the periods in our country's history when its laws and policies were firmly rooted in Biblical principles." The website also provides information on a program it organizes where representatives and senators share their political views with pastors and ministers. In 2012, Barton published the widely discredited The Jefferson Lies. Throckmorton and Michael Coulter refuted in their own book, Getting Jefferson Right: Fact Checking Claims about Our Third President and Barton's book was subsequently dropped by its publisher, Thomas Nelson. The book's claims have also been the subject of criticism from a variety of Christian academics including historians John Fea at Messiah College and Gregg Frazer at John MacArthur's The Master's College. Yet Barton's message and influences continue to sway politicians; in 2011, former presidential candidate Mike Huckabee gave a tongue-in-cheek endorsement ofBarton's message. "I almost wish that there would be something like a simultaneous telecast and all Americans would be forced, forced — at gun point no less — to listen to every David Barton message. And I think our country would be better for it. I wish it'd happen," he told the audience at the Rediscover God in America. Barton also has close connections with conservative politicians Michele Bachmann, Ted Cruz, and Rand Paul. No one in the WallBuilders office was available to comment by press time.